I added this to Vintage OC Transpo, but this also would be of interest here. The latest issue of Transfer Points got ne thinking of this Charles Lahickey photo from July 11, 1979, along Queen Street, Gray Coach Lines 1412 alongside PCC 4412. Note the what looks to be an OC Transpo Teletranspo RekVee Clubcar in the opposite direction very far from home. If there is any doubt the bus is an OC Transpo unit, the fleet number appears to be 9769--97** series number of these buses. I seem to recall reading that because the RekVee buses were owned by the province they often got shuffled around to different agencies i.e. a Kingston Transit RekVee could find itself in TeleTranspo service and vice versa. Or could TeleTranspo buses ever find themselves doing charter work? I was sort of at a loss where to post this as it could also go in one of the Toronto forums as it would be of interest here as well, but I think some might find this of interest here. It's a Charles Lahickey photo from July 11, 1979, along Queen Street, Gray Coach Lines 1412 alongside PCC 4412. Note the what looks to be an OC Transpo Teletranspo RekVee Clubcar in the opposite direction very far from home. If there is any doubt the bus is an OC Transpo unit, the fleet number appears to be 9769--97** series number of these buses. I seem to recall reading that because the RekVee buses were owned by the province they often got shuffled around to different agencies i.e. a Kingston Transit RekVee could find itself in TeleTranspo service and vice versa. Or could TeleTranspo buses ever find themselves doing charter work? As well as the seamless windows would also indicate a/c on these particular GO buses although seamless windows were not a requirement for a/c equipped buses, they seemed to be preferred for some agencies like Chicago and the Southern California RTD. To add to Dan's point, the a/c worked wonderfully on these buses, but on this day I took this photo of 1100 September 1, 1997 the a/c did break down on an exceptionally hot day. It was the only time I ever had been on a GO New Look with malfunctioning a/c and on that day it was brutal. It was also the first time I had ever opened a New Look roof vent as evidenced in the photo, requested by the exasperated operator as I was the tallest passenger on the bus. I say exasperated operator as he was getting a lot of flack from the overheated passengers. 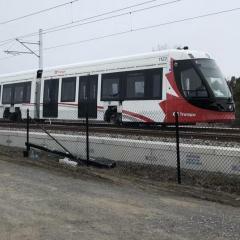 Loving my newest Rapido bus TTC 8330. Just curious, did this esrie of bus have a different roof vent/emergency escape hatch configuration? TTC 2811 heading Eastbound on Eglinton just past Laird January 12, 2003. TTC 2294 starting up, May 5, 2010. TTC 2294 and 2255 heading north on Bay, May 5 2010. On a very cold January day in 2003. TTC 6216 on a very cold January day in 2003.
https://bramptonist.com/recent-changes-on-kitchener-go-line-actually-mean-worse-service-for-brampton/ I got this in a text from a Brampton friend of mine--he is screaming blue murder abou this. I'm not as familiar as I should be on this issue but it seems the article leaves out some points. But again, I'm not as familiar with this as some of you might be on this board. Ex UTA-TTC 1006 on a very cold December day in 1997.